How often have you wanted to whip up something sweet only to daunted by the complexity or ingredient list of a recipe? No more! Bestselling Simple author Jean-François Mallet has taken out the inconvenience with more than 130 delicious, easy recipes. 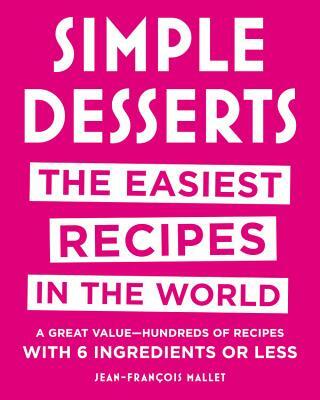 Simple Desserts combines interesting flavors and all-natural ingredients, so novices and experts alike can prepare time-saving but gourmet treats! Using Simple Desserts clean design, large type, and handy icons, you'll whip up Speculaas ice cream or a Strawberry Melon Granita in less time than it takes to drive to an ice cream shop-and for a fraction of the cost. Now there will be no reason to buy dry store-bought cakes or crumbly cookies when you've got Simple Desserts. Bread pudding with berries, macarons, chocolate mouses, apple and honey tarts, and cherry crumbles have never been so easy to make. With plenty of recipes to please any chocolate lover or cookie fanatic, there are also many seasonal fruit cobblers, sorbets, soufflés and tart berry pastries perfect for summer or holiday get-togethers. Jean-François Mallet, a trained professional chef as well as a talented photographer, has worked with some of the biggest names in cooking, including Joel Robuchon, Michel Kenever, and Michel Rostang. His work has appeared in magazines including Saveur, Elle, and Gourmet, and he is the author of more than two dozen cookbooks and the international bestselling Simplissime series.